Jackie Olin will launch her baby food business after winning first place during UCSC's first-ever Business Plan Competition. Photo by Terry Way. 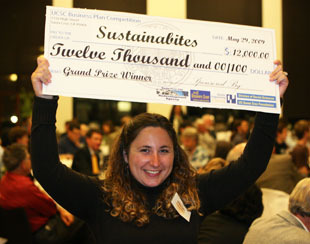 From a high-tech pill bottle cap that helps patients monitor their intake of prescription drugs to a proposal for locally produced organic baby food, the ideas presented during the first-ever UC Santa Cruz Business Plan Competition prove UCSC students and recent graduates mean business.
. First place: Sustainabites Baby Food by Jackie Olin (B.A. community studies, 2008), a company that would offer fresh organic baby food made from local, organic produce grown sustainably on farms within 150 miles of Santa Cruz. Cash award of $12,000.
. Second place: Sky is the Limit by Chirag Sharma, a junior majoring in bioengineering and business management economics, would combat the widespread problem of counterfeit pharmaceuticals by placing a nucleotide into each tablet during manufacturing. Cash award of $2,000.
. Third place: Lingua Earth by David Olsen, a graduate student in computer science, would use video-game technology to help busy people learn foreign languages. Cash award of $500.
. Peoples' Choice Award: Pherica by Jarrett Fishpaw, a graduate student in economics, would create high-tech tracking systems to help patients monitor the intake of their prescription medications. Cash award of $500. The competition, which was open to all UCSC students and alumni who graduated in the last two years, was designed to stimulate entrepreneurial activity on campus and to increase awareness in the community and Silicon Valley of the resources available at UCSC. In opening remarks, UCSC Chancellor George Blumenthal noted the relationship between entrepreneurship and education, saying the competition would help build an "essential bridge between us." Entrepreneur Philippe Kahn, chairman of Fullpower Technologies, delivered the keynote address to a festive gathering of more than 150 people during Friday's showcase at UCSC's University Center. Speaking without notes, Kahn, a high-tech inventor who built the first camera phone and holds dozens of other patents, captivated the audience with tales of his own roller-coaster ride in business, emphasizing the value of hard work--and luck. "Do you think you're going to be more successful because you're lucky or smart?" Kahn asked moments before the winners were announced. "I'll pick luck any day." But he urged students to be open-minded about what constitutes luck and reminded the audience of his own wrenching experience of being ousted by the board of directors of Borland, his first company. "But that turned out to be really lucky, because I got to build another company that was way more successful than the first company," said Kahn. "So the question for all the business plan teams today is, are you lucky to win or are you lucky to lose?" For Jackie Olin, who has been teaching preschool while trying to launch her Sustainabites Baby Food company, that question was easy enough to answer. Holding the first-prize check for $12,000 aloft, she beamed and said, "This is such a surprise. I didn't think I could do it! This means we can stay in Santa Cruz!" Cash awards were intended to help winning teams turn their ideas into reality, but event organizer Eric Gonzalez said each team that made it to the finals plans to move forward with its proposal. Gonzalez, who earned a B.A. in business management economics in March, spearheaded the drive for the campus's first business plan competition. The success of the competition exceeded his wildest dreams, he said, noting the multi-pronged collaboration among students, community members, local government, industry representatives, and the university. "We've achieved much more than I ever thought we could," said Gonzalez. "Next year's will be even bigger." The City of Santa Cruz Economic Development and Redevelopment Agency, which is working closely with UCSC to help create a culture of entrepreneurship in the community, played a key role in supporting the competition. "Pairing students with industry mentors who can provide expert tutelage expands the learning experience and reinforces the lessons of the classroom in real-world scenarios," said Peter Koht, the city's economic development coordinator. The goal of the competition is to generate viable business ideas, emphasized economics professor Nirvikar Singh. "This is a really important step forward in terms of the university and city working together," said Singh. "When you think about how the U.S. economy is changing, our comparative advantage is in creativity, design, and innovation. The campus can help with that. The essence of entrepreneurship is seeing opportunities and organizing a team that can satisfy a need in an effective way." All seven teams that made it to the finals were winners, said several faculty members, including James Davis, professor of computer and information science, who secured a $15,000 UC Discovery Grant to fund the competition. "A lot of students have great ideas, but then they graduate, get a job, and the idea is lost," he said. "A competition like this gives students an opportunity to develop their ideas to the point that when they graduate, they have a real decision to make about whether they'll pursue it." Teams worked hard to prepare their proposals, which averaged 35-70 pages in length, by attending workshops on defining target markets, identifying competitive advantage, funding strategies, and high-tech trends in engineering. Opportunities have already opened up for participants, noted Mary Flannery, a lecturer in the Economics Department who judged the first round of the competition, which took place in February. Some students are considering graduate study to pursue their ideas, and at least one has been offered a research position to develop his plan, she said. Gonzalez said his only regret is that he was too busy planning the event to participate in the competition: "I definitely would've been on a team," said Gonzalez, a former president of the University Economics Association whose own interests lean toward technology, with a focus on marketing and sales. "This really cemented my faith in the education we're receiving at UCSC," said Gonzalez. "We're not just students trying to get by. We're going to make a difference." Sponsors of the Business Plan Competition included the City of Santa Cruz Department of Economic Development and Redevelopment, the UC Discovery Grant, the Baskin School of Engineering, the Division of Social Sciences, and the UCSC Foundation. Judging the competition were Cliff Warren, president and CEO of Raytek Corporation; Judy Owen, general partner of Calumet Venture Capital; Laura Bushnell, partner of Latham & Watkins; Krishna "Kittu" Kolluri, general partner of New Enterprise Associates; T. Chester Wang, cofounder and managing member of Acorn Campus; Ted Goldstein (B.A. computer and information sciences, Oakes College, 1983), entrepreneur and former vice president of Apple Computer; and Robert Blumberg, managing director of the Soquel Group (B.A. information sciences, Cowell College, 1976). In addition, dozens of business leaders volunteered their time to mentor teams.